Still catching up on the snow-driving jagoffery from last week. When you live in Pittsburgh you SHOULD become somewhat of a bad-road-aficionado. 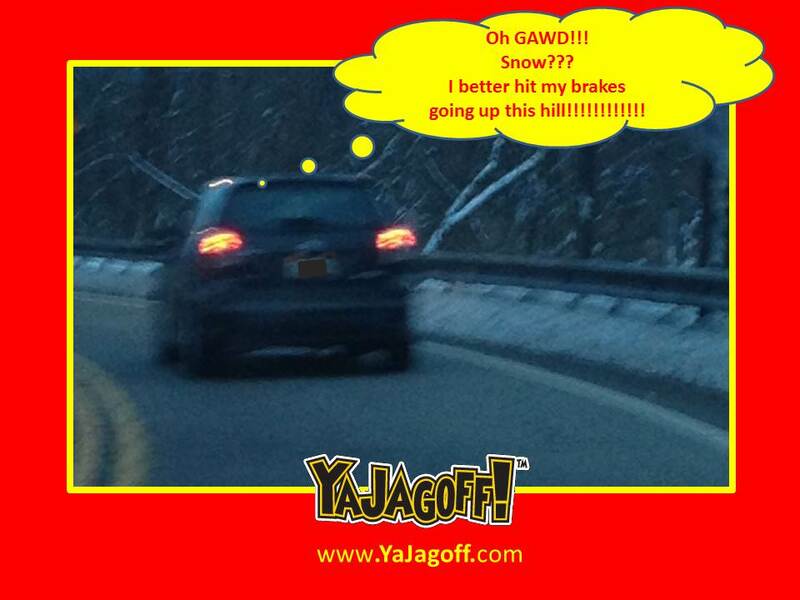 You know what we mean…when the ice and snow hits, Pittsburghers know to do only 15mph over the speed limit. Last week, when 3-feet of snow fell in about 7 minutes, we found ourselves behind someone unfamiliar with Pittsburgh-winter-weather driving tactics. To be clear, we aren’t condoning reckless driving and we also understand that leaving our hopes in some local road crews to clear the roads is as much of a long shot as getting Ray Lewis to start the Baltimore chapter of Steeler Nation. But we think that, the guy in the picture above, is indicative of the kind of ‘Burgher that runs to their underground fallout bunker at the first snowflake that kisses the grass. Pretty sure that, as the above picture was being taken, we were getting passed by a horse and buggy and kid on a Big Wheel!!!! Notice that this driver is applying his brakes, GOING UP HILL, as we pass a 35mph sign. Next articleThe NHL Boys Are Back In Town!!!!!! LOL.. glad that you found it humrous.. maybe that was he case with this guy… probably costs him a fortune in break pads!!! lol Thanks so much for reading!! Hair Peace Charities – TONIGHT!! !